The Frug Diet. How an old pair of pants can have long term impact on your health. Okay, here it is. Are you ready? There’s nothing to click on, no free report to download, no exotic powders to buy, no veggies to blend. That’s it. There’s also an advanced version. Step 1. Don’t buy new pants or belts. When I decided to start living lean about a year ago,one of the first things I did was go through closets and drawers and give away clothing I no longer wear. I came across was an old belt I had in high school. I’m not kidding, my mom bought me this belt at the GAP when I was in high school. I also remember getting a sweet pair of corduroys as part of that deal. The GAP website still has the same pair of corduroys and belt available. That’s because once every decade the clothing industry recycles every fashion trend. The 80s are currently being heavily recycled — cords, Day-Glo, Ray-Ban Wayfarers etc. I’ve got this decade nailed. Being a Frug and giving away stuff sometimes creates a conundrum. You don’t mind giving away a pair shorts that no longer fit but you really hate going out to replace them. The same goes with the old belt. Old belts tell another story. If you held onto the belt long enough, those damn holes on the belt that show your progression over the years. If you’re like me, you’ve probably worked your way through each of the holes until you get to the last few holes then you get rid of the belt. For some reason, this one hung around. This was a message. I needed to go on a pants and belt diet. If you’re not frugal, and buy a new belt every year, you won’t notice this progression. So, what does one do with a 30-year-old belt and a 20-year-old pair of shorts. Put them on, of course, and convince yourself that they still look fine. If they don’t look good (as was my experience) you have now discovered the Frug Diet. If they do look good, they have officially become vintage. So now you have a choice. 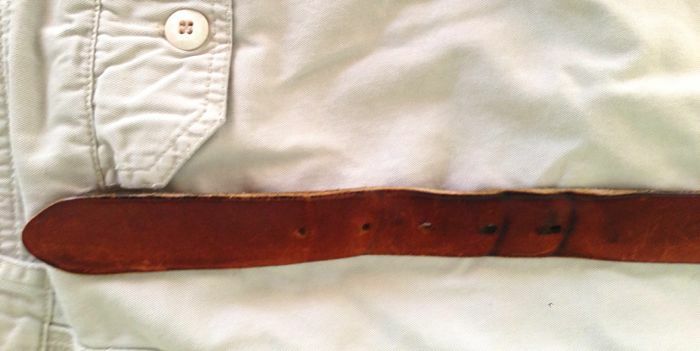 You can get rid of those old pants and that belt that tells the terrible tale. Or you can decide to keep them. This is where the belt will really come in handy. Starting with the last hole you can decide to walk your way back down the progression and get to keep the belt for another 20 years. In accomplishing this, you could add another +/- 10 years to your lifespan and rarely if ever need to buy another pair of pants or belt again. So now you have the WHY. But what about the WHAT and most importantly HOW. Check out this quick explainer video from Dr. Mike Evans shared by Mr. Money Mustache. I really think I’m onto something with this vintage clothing / fitness trend. After a year of this, I have nearly arrived back at the last hole right where I left it a decades ago. But I still have three holes to go until I get to the middle the belt where the whole thing started.